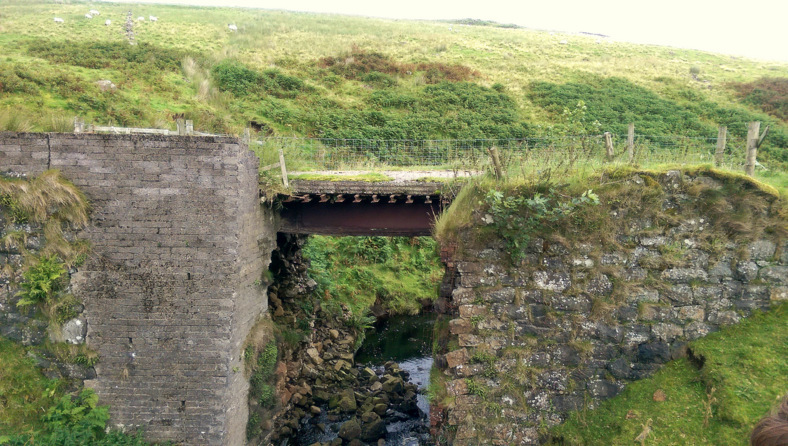 The footprint of the abandoned Ballymena, Cushendall and Red Bay Railway winds silently through the Glens of Antrim. The scenery along the old narrow gauge railway route is truly magical; it’s time to make a nailed-on tourism case for creating a walking and cycling greenway to lift the local economy. The Ballymena, Cushendall and Red Bay Railway opened in stages between 1875 and 1876. The line was initially constructed to service the transport of iron ore from various mines to the north of Ballymena to Red Bay for shipping to England. A depression in the market in the 1880s led to the line being taken over by the Belfast & Northern Counties Railway in 1884 and it was gradually upgraded to enable passenger services. Due to the difficult gradient down to Cushendall the line terminated 3 miles away at Retreat, and passenger services halted at Parkmore, just short of where the line crosses Glenariff Forest Park today. The station at Parkmore still stands today, just beside the Ballyeamon Rd / Glenariffe Rd junction. Passenger services ran until 1930 and the line ceased all operations in 1940. The footprint of the line in Ballymena out to the M2 has been almost fully erased by housing and road development over the decades; it’s impossible to see this being resurrected. For a more contemporary plan to enable leisure walking and cycling trips through the town, the Braid River Greenway offers hope (more later). A brand new link from Broughshane to the old railway line may be possible. Once out of Ballymena town, intensive farming activity over the last 75 years has removed most traces of the line even from satellite imagery. Occasional glimpses of a railway hedgerow or embankment are rare through Quarrytown until the line reaches Rathkenny – one example being the line approaching the Knockan Road at Turtles Garage in the picture below. From Rathkenny to Cargan the line runs in close parallel to the Cushendall Road. This affords a continuous view of embankments, cuttings and tree lines, frequently punctuated by buildings which have cropped up on the old trackbed – the car dealership Wilson’s of Rathkenny being a prime example. Resurrecting a fully continuous railway line converted to a greenway path through Martinstown to Cargan seems to be a challenging prospect, given this development. Around and beyond Cargan are the railway sidings which provided the impetus to originally create this railway, to the iron ore mines (see map). This fascinating aspect of local history could be brought to a wider audience by extending pathways outwards from the ‘main line’ along these mining routes, possibly linking in with the Dungonnell Way walking route. Climbing sharply out of Cargan, the main line frees itself of all building development and hugs the Glenravel Road. 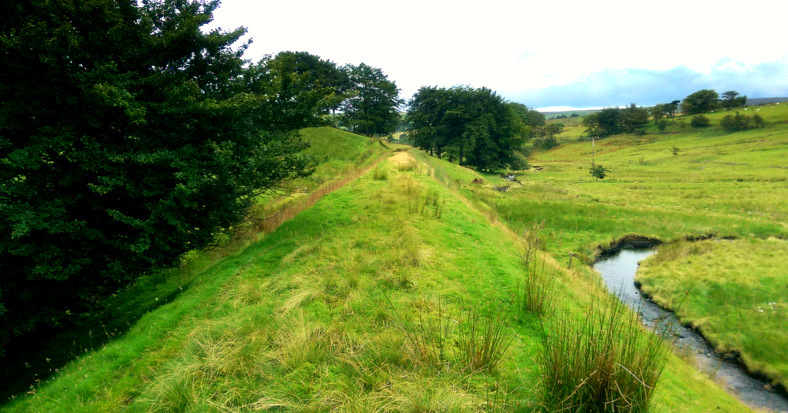 Long stretches of embankment dovetail with mountain streams and provide well-worn trails for local livestock. 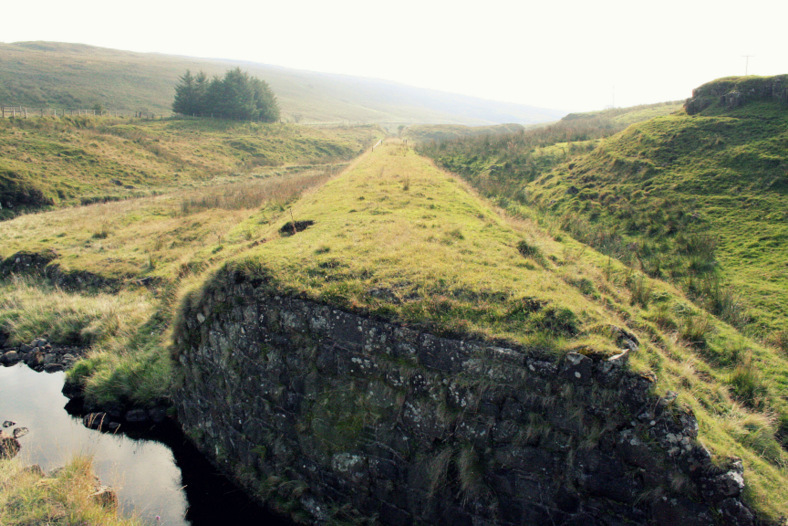 At the junction of the main line and Evishacrow mines, the siding bridge can be seen gradually crumbling into the river. Old rails cut to support a concrete track are clearly visible, although the bridge is too fragile to support more than the odd sheep these days. The main line sweeps majestically through a valley from here, crisscrossed by the Cargan Water stream, with bridge abutments crying out to carry people across once more. There is no difficulty selling the idea of a greenway here – this picture (adding a path and tourists) would proudly sit alongside some of our key tourism draws. 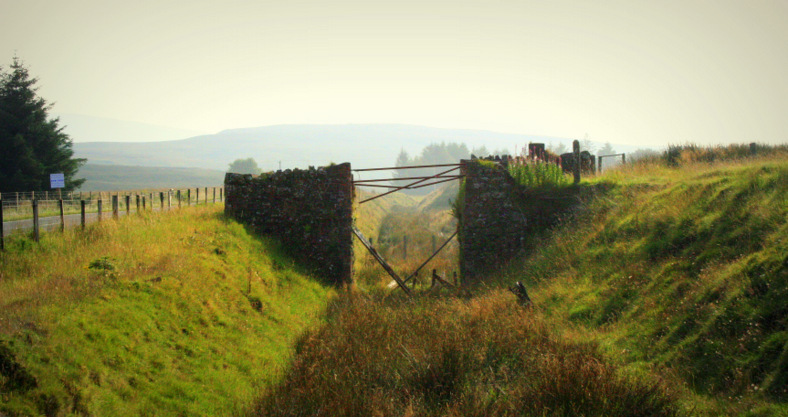 Along the stretch from Cargan to Retreat old bridges which used to carry folk over the railway are visible, many braced against the inevitable deterioration which decades of loneliness brings. Imagine how a greenway project could restore these magnificent features to preserve for future generations and signal our pride in our engineering heritage. You can read a little more on the history of the area on the Glenravel Historical Society website. I stumbled upon this section in September 2013 and fell completely in love with the place and the greenway idea. 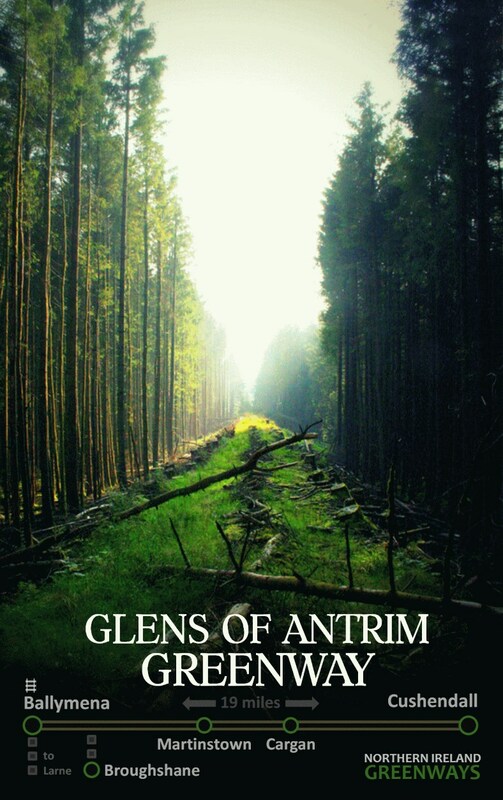 There is a pronounced kink in the Ballyeamon Road as it enters Glenariff Forest Park, which obscures a remarkable straight route through the woods for the old narrow gauge railway. 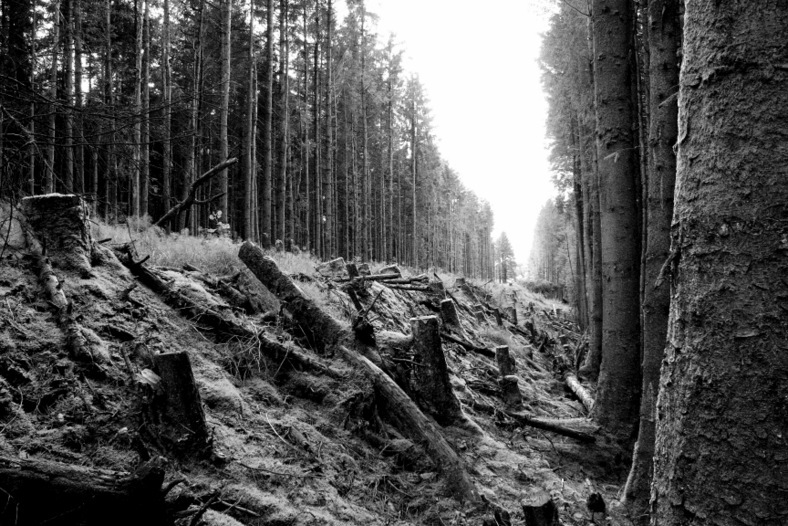 This begins as a hulking embankment at the southern end, rising through the trees towards a cutting at the northern tip where the road latches on once more. 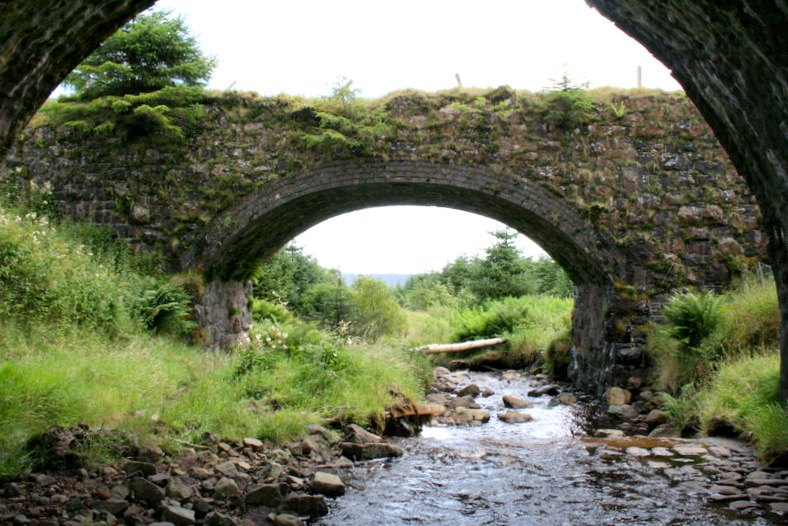 A stream running across the mossy forest floor meant the railway line needed to cross a bridge. 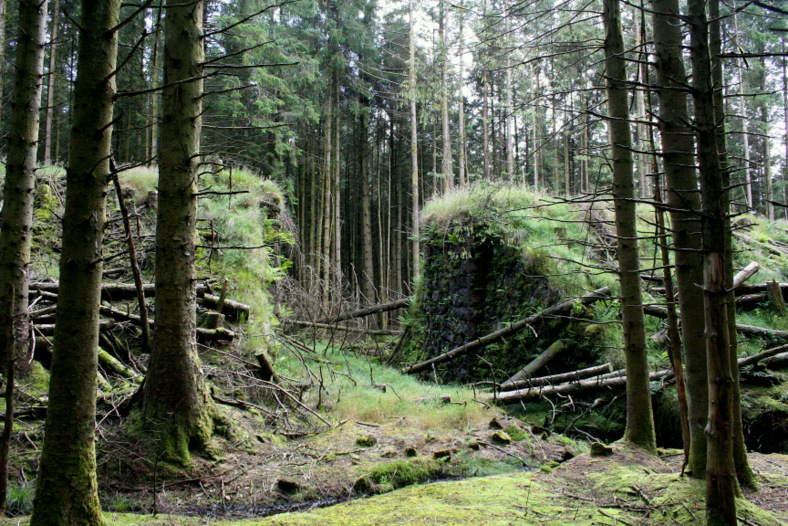 The remaining abutments silently stare at each other in this eerie, hidden clearing. The towering trees, swaying and creaking gently in the wind, set against this human achievement of driving a railway across the Glens of Antrim gives a truly magical feel to the place. At the head of the wooded section is another old bridge which used to cross the railway line, marking the boundary between the real world and the secret place beyond, evocative of our own C.S. Lewis and stepping into Narnia. Just beside the forest corridor are the Essathohan Bridges, the rail and road bridges set side by side. 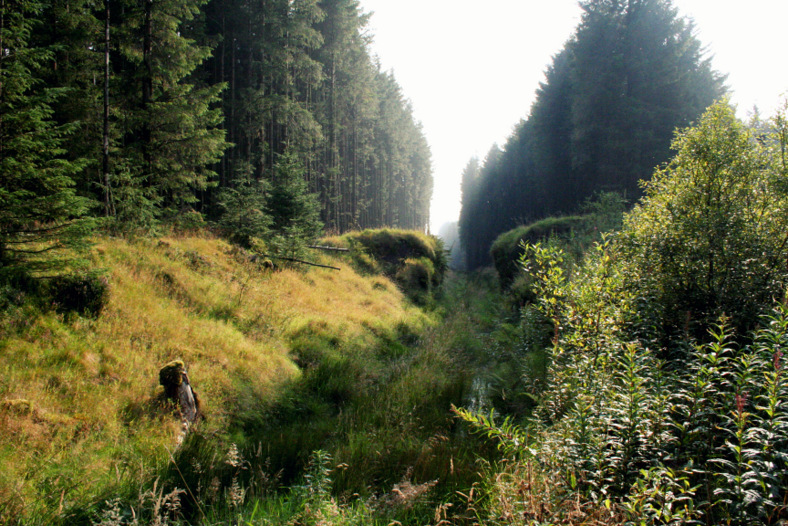 This is one end of the Dungonnell Way and pony track around Glenariff Forest Park. Having an established forest park right on the greenway offers the chance to develop camping facilities, allowing tourists on long cycling holidays the option to base themselves in the area for a night or two. From Glenariff, the route crests over the glen and begins to descend towards Cushendall. 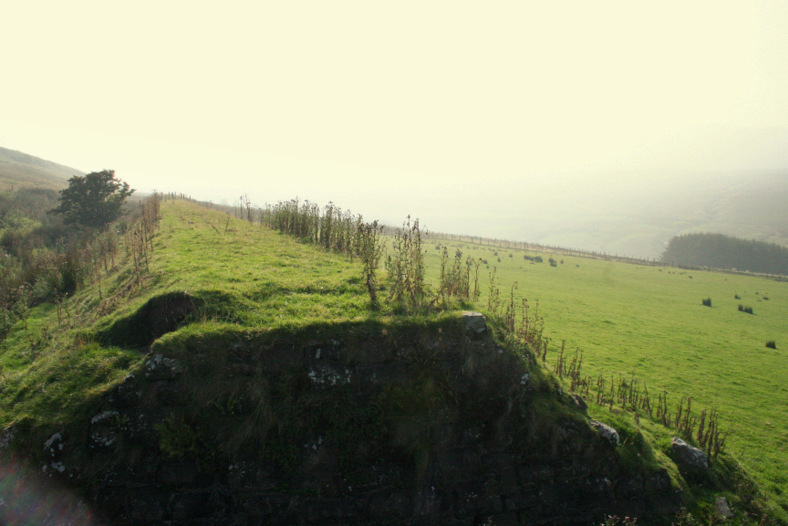 The Essathohan siding marks the highest point for any railway in Ireland (319m) which in turn would make this the highest greenway in Ireland – a nice selling point. The embankment pictured here clings perilously to the side of Crockalough as the railway line reaches its terminus. The engineering challenge of taking the railway down to Cushendall and Red Bay, or more likely the prohibitive cost, meant the line terminated here at Retreat. This perch on the hill provides epic views down towards Cushendall and, on a clear day, all the way to the Mull of Kintyre. With no rail link beyond Retreat, passengers were carried from Parkmore to Cushendall by coach, however to create a world-class greenway a solution to bridge this 3 mile gap from Retreat will need to be found, perhaps along quieter country lanes down the hill. Like the ideas to reconnect Ballycastle with Ballymoney with a greenway on the old trackbed, or Newcastle with Belfast along the old Belfast and County Down Railway, the pretty coastal village of Cushendall could once more see tourism and leisure traffic driven to the town by the Ballymena, Cushendall and Red Bay Railway line. Looking at the map below there are a number of existing pathways across the town hugging the river bank. An obvious plan would be to link these with an improved riverfront, so shamefully surrendered to the car parking needs of the Braidwater retail park. Who knows, perhaps a Maine River Greenway could link the future greenway at Randalstown to Ballymena and beyond to Cullybackey? The Ballymena, Cushendall and Red Bay Railway wasn’t the only narrow gauge railway terminating in Ballymena. 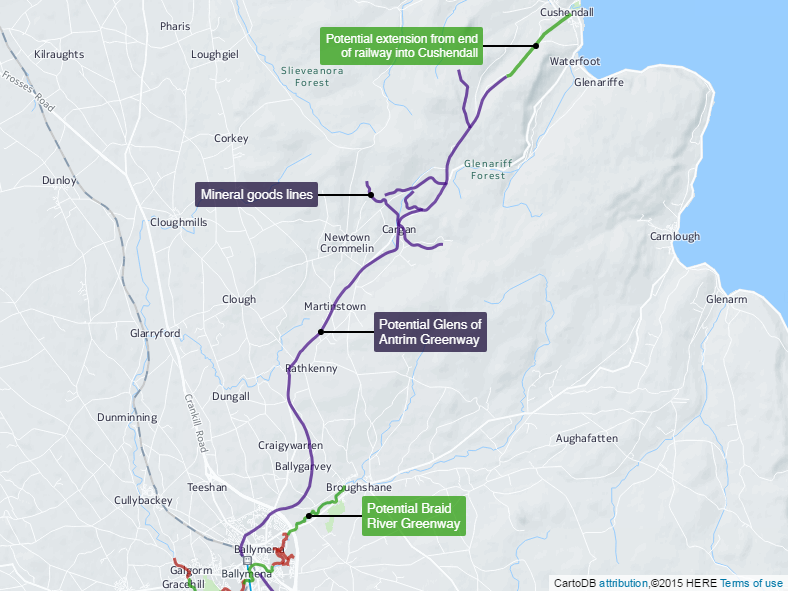 Not content with the idea of a riverside pathway network and a greenway rising up through the Glens towards the coast, there is scope to create a further greenway from Ballymena to Larne – but that’s for another time.. 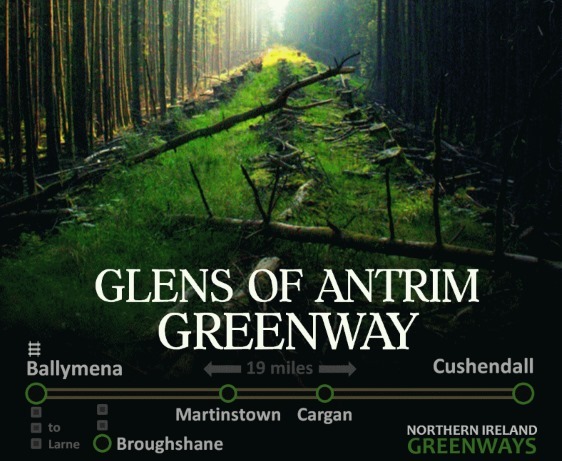 The greenway plan lies between two council areas, Mid & East Antrim Borough Council from Ballymena to Parkmore and Causeway Coast and Glens Borough Council from Parkmore to Cushendall. 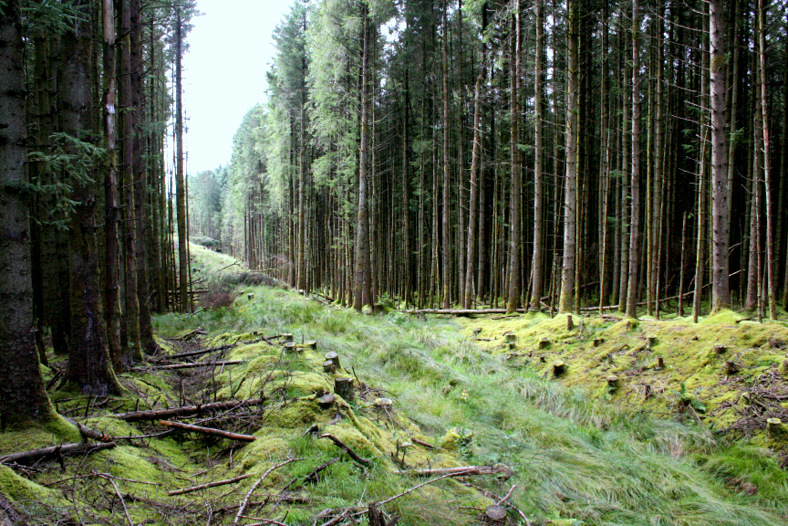 There is also a large section under the control of the DARD Forest Service through Glenariff. However the majority of the route is likely to be in private ownership following the sale of railway property following closure. Development of a greenway will depend upon the creation of a strong local lobby and partnership between politicians, stakeholders, community interests and landowners. The Great Western Greenway in Mayo isn’t a copy-and-paste blueprint for solving thorny issues, however the partnership working which delivered and maintains that project is worth reflecting on, as are the documented and cherished economic benefits to that remote region. While decades of farming and community growth makes a route out from Ballymena challenging to say the least, the upper reaches of the old line sit in plain view and unhindered by recent human development. 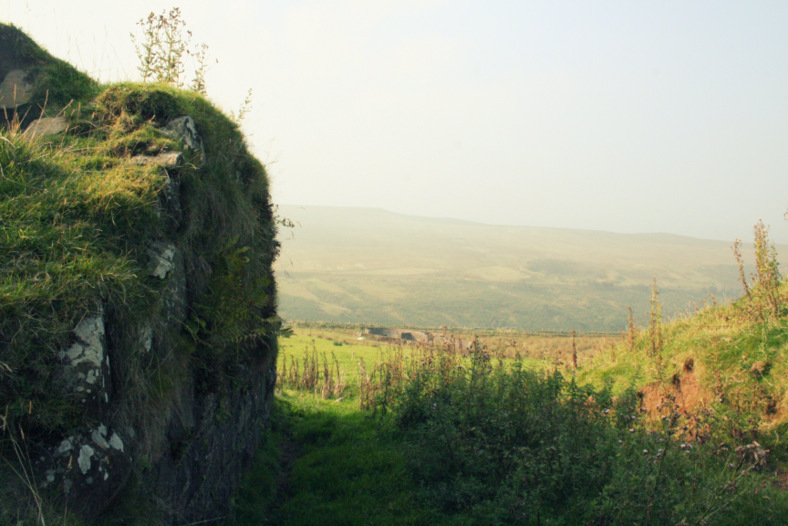 The beauty of the surroundings and the resilience of the cuttings and embankments to survive the decades challenges us to imagine how this line can once again carry people, from near and far, across the Glens of Antrim.